When it comes to the best of the best, the Nonin WristOx2™ 3150 is a top contender in the medical industry. It’s designed with Nonin’s PureSAT® signal processing technology, which filters each pulse at a time to deliver the most accurate measurements – even during challenging environments or critical SpO2 levels. Due to its advanced capabilities, the WristOx2 3150 can be used for a wide range of applications, including overnight sleep studies, cardio-ambulatory monitoring, remote wireless monitoring and even daily activity monitoring. Along with versatility in function, it is extremely portable and easy to use in one’s own home or a clinical setting. The ability to record and store patients’ oximetry readings is vital, especially when you’re trying to reach a diagnosis. Thankfully, the Nonin WristOx2™ 3150 Starter Kit comes with a smart data management software, called nVision, and a download cable to help you transfer readings. The nVision software, with screening and reporting applications, makes it possible to view and analyze a patient’s results easily. It can even pre-screen patients for an overnight sleep study or a 6 Minute Walk Test. While the USB download cable makes it possible to download results faster, the 3150SK also comes with Bluetooth wireless capability (up to 100 meters in range), which offers a convenient alternative to transferring data securely. An average pulse oximeter can hold between 24-80 hours of SpO2 and heart rate data, but the WristOx2™ has an enhanced memory of up to 1,080 hours! This bounty of storage comes in handy when you need a pulse oximeter for extended periods of monitoring, which means you’ll need a powerful battery to match. The 3150’s battery life can last up to 48 hours without using Bluetooth and 24 hours with continuous Bluetooth. 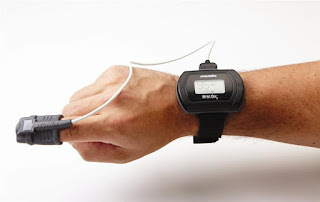 No matter how advanced the technology is, this pulse oximeter is actually very simple and comfortable to use. Clinicians can pre-program the oximeter before sending it home with a patient. Then, all it takes is putting it on! Get comfort, accuracy and innovative technology all-in-one with Nonin’s WristOx2™ 3150SK from Concord Health Supply.